The new Traidcraft Fair Trade Shop in Middlesbrough's Dundas Shopping Centre. A Fairtrade shop has opened in Middlesbrough’s Dundas Shopping Centre for Christmas, re-starting a 30-year-old tradition. 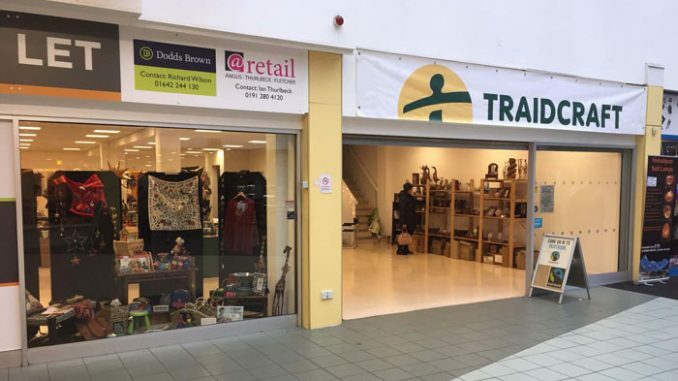 Traidcraft has opened every year during the festive period since 1985 in different retail units in Middlesbrough town centre. It is a Fairtrade business which trades with a bias to the poor and enables producers to receive a proper return for their skill and hard work. In 2017, organiser Jenny Medhurst was unable to find an outlet in Middlesbrough during the Christmas period, but this year she returns to a unit in the main shopping mall in Dundas Shopping Centre, where she last traded in 2014. She says: “I am delighted that the Dundas Shopping Centre could accommodate us once again, so that we can continue to offer unique and ethical Fairtrade goods to the people of Middlesbrough. People’s lives change through fair trade. “We are in talks with a number of retailers about the space which is presently available in the centre. Interest has been heightened since the Budget announcement of the business rates reduction for the next financial year where town centre retail properties with rateable values of £51,000 and below will benefit from a one third reduction for two years from April 2019.